SHOW DESCRIPTION: State of the Nation with Jessica Soho is the flagship nightly news program of GMA News TV, first premiering on February 28, 2011. It is anchored by Jessica Soho, a Peabody Award-winning journalist and former head of news programs of GMA News and Public Affairs and writer, producer and host television documentaries, and is one of the Philippines’ most awarded journalists. It also aired worldwide via GMA Life TV and GMA News TV International. The program is described as a more comprehensive newscast than 24 Oras, which is the flagship news program of GMA. 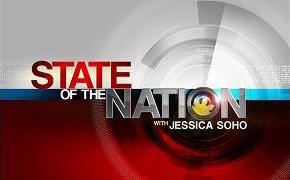 State of the Nation with Jessica Soho currently airs on weeknights at 21:00-22:15 (PHT). It features several guests to analyze the country’s issues deeply in segments, as well as featuring exclusive reports and the insights and rundown of the day’s top news stories.